With this kit you will receive all the stainless steel bolts, washers and nylon nuts you need to fit the tail light to any 1200 style air-cooled VW Beetle. This 6 piece stainless kit contains everything you will need for mounting the headlamp onto any pre-62 model air-cooled VW Beetle. With this kit you will receive all the A2 stainless steel bolts, nuts and washers you need to mount the front and rear blade bumpers to your VW Beetle. This 12 piece kit provides all the necessary fastenings for restoring the front door hinge of any air-cooled Volkswagen Beetle. 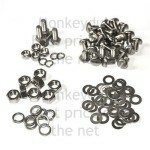 The stainless steel nuts, bolts and washers in this kit are all you need for replacing or restoring the fuel tank fastenings in any air cooled VW Beetle.